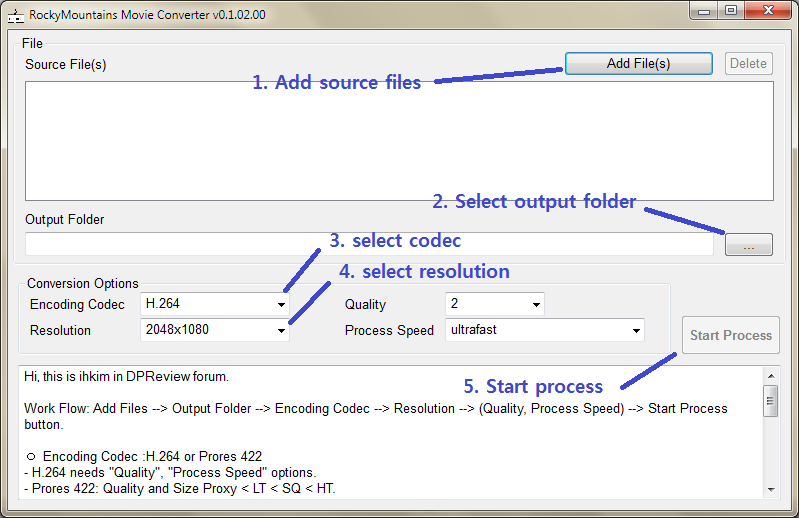 (Updated:) New version of Movie Converter has been released and posted it in SourceForge. Please use it in below link. You can download it from below link. You will see installer after you unzip it. After I purchased Samsung NX1, I took some 4K video with NX1, but I was not very happy about Samsung Movie Converter which came with NX1. My complain was not from the quality after the conversion. Even its long process time, the result was not still I can easily use to work with. For now, I mostly work for FHD (1080P) in order to upload my video to YouTube. But, still I want to keep 4K movie. So, I wanted to find a way to convert NX1 4K H.265 to 1080P resolution with more popular (H.264 or Prores) codec. My goal is not keeping the result, but more for editing it easily. Once edit it, I will remove the converted files and keep only 4K source. After some amount of time of research, I found famous ffmpeg and I could convert NX1 4K H.265 to both codec. So, I implemented this GUI application to execute ffmpeg for the batch conversion. It is simple and faster than Samsung Movie Converter. This software will not change anything other than the video frame size (when if you select one of 1080P resolution) and encoding codec. 2. What this software can do? Can convert multiple source movies. Can set target directory where the converted files will be created. Can encode to H.264, H.265 or ProRes 422 Proxy, LT, SQ and HQ codec. Can resize the 4K source to 1080P or keep the original resolution. Supports one or mutlitple files Drag & Drop. If a folder is dropped, it will be used as “Output Folder”, otherwise all MP4 files will be added in “Source Files” list. 3. How to use it? Below screen shot shows normal work-flow. It is simple. 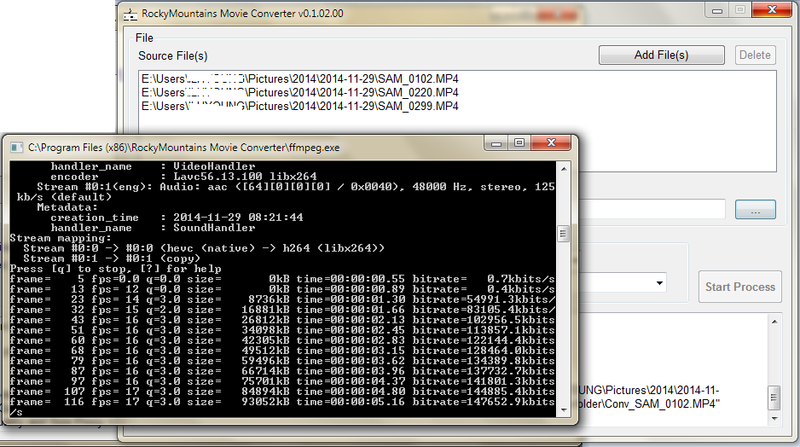 Following screen shot shows the converter invokes ffmpeg and converting 4K files. If you select H.264 codec, you may or may not need to change “Quality” and/or “Process Speed” options. The default settings are for good video quality and decent file size and fastest options. Smaller number of “Quality” option means better quality, but result file size will bigger. Faster “Process Speed” option will not affect the result image quality, but its file size will be larger. If you select ProRes 422 option, “Process Speed” option will be disabled and the value won’t be used. You can select one of Proxy, LT, SQ and HQ profile in “Quality” drop down list. 4. So, How much is it? It is FREE of charge. You can use it freely. But, you need to use it with your own risk. I will not warrant or support anything. I hope you enjoy the software and please let me know if you have any question. You are welcome. I am glad to hear you like it. I am also a programmer and really appreciate when someone offers their work to others. Thanks! It works great. Forgive my ignorance, but is there a way to use this for a Mac based computer? Converting the NX1 is a nightmare and makes me want to return it. I am currently working on creating new converter for OS X as well as Windows. Have you released the Mac Version yet? Thanks! You can download Mac version from below link. Thank you for creating this fantastic program. Thank you in the first place for this fantastic program! Question, could you implement the “-hwaccel” option. Thanx for the nice program! I am glad to hear that you like this. I will research about the option. Thank you for your suggestion. Can you please fix it so it will take a 4k file and give the same 4k file site but in the right size not 10 times the size. I believe that “same size” means “Same as source” for the resolution option. H.265 is high efficient codec. When you re-encode NX1 4K movie file into H.264 or ProRes, the size will be a lot bigger. It is not a bug. But, You can select lower Quality option for getting smaller output file. My software default value is for getting very high quality for the output file, because I intended to use the output file for editing, not keeping. You can play with “Quality” option for finding good balance between quality and size. Thank you for this program, it has suited my needs perfectly. If I may, I do notice sometimes (blue sky, or large white areas) that macro blocking can be introduced during prores conversion (even with HQ settings). I noticed this with iffmpeg, wondershare and sometimes with your software too. However I love the speed of your software it is incredible ! I didn’t know there is an issue like that. I am not a video expert. The software is designed to be a GUI shell for ffmpeg. If ffmpeg has the common issue, it cannot help for the issue at this moment. Probably, I need to further research for the issue. Thanks a lot for your answer and for this great software 🙂 I’m saving a looooot of time thanks to you ! Also, I’m using the mac version, and it is not very easy to change the output folder (you have to restart the software). Would it be possible to have a “browse” button to chose which folder we want to output the files to ? Also I don’t if it possible, but a “remaining time” information would be interesting too. Thank you for your kind comments. For setting output folder, you have only to drag and drop a folder in “Files” area to set output folder. I will research about remaining time. Thank you very much for your perfect software. Great job! Congratulations! I love this software but for some reason the audio is highly compressed in the ProRes option, even at HQ. The H.264 option has great audio, any idea why only the ProRes audio is bad? Is it? That is interesting. When a video clip is re-encoding as ProRes, currently it doesn’t re-encode audio. I will research this issue. Thank you. Thanks for the nice software. Just downloaded the latest one and using it. It is a lot faster than the Samsung movie converter. Would love to see progress bar showing % done in the future release. Please please please can you update this to support output to 3840×2160??? I want to work with my ultra HD footage in my NLE. I read that if you select “same as source” it does not mean that. If I select that option it exports my 4k file to the same resolution, but is the resolution really the same? Or is it just 1080p upscaled to 4k? if you select “same as source” option, ffmpeg will not change the resolution. No upscale. Just re-encode to another codec. If the source is 4K with “same as source” option, the output should be 4K. The file sizes and bit rates are all over the place!!! I need to control the bitrate for import into Premiere! Currently, there is no option to set specific bit rates for the conversion. But, while the conversion is going on, you should be able to see what is current output bit rates being processed in Conversion dialog. Based on the info, you can change “Quality” option up or down. What do you mean by “not work on After Effect”? is it possible to convert h264 to h265 with your apps ? Yes. You have only to drag&drop source mp4 files (H.264) and set output codec as H.265. Change different quality option and try. You should be able to find right (quality/file size) option for your purpose. You are a genius, THANK YOU! THANK YOU!!!!! Now I love my NX1. I found a bug. Is this program “UTF8 safe”? I have some Czech characters in my folder names and the program is not working. But, if I copy the command you called and paste it into “cmd.exe” it works fine. I also PrintScreened the error and it is “No such file or directory” and the folder names in black window is not written correctly. Yes, updated 0.2.00.0 version in SourceForge link supports UTF8 characters. I tested and used with Korean characters in folder/file name, it worked fine. I didn’t test Czech characters, though. I will check it out. Congratulations. But I can tell you that it does not recognize MKV h265 files.I have a video file that is MKV V_MPEGH / ISO / HEVC. I want to convert in H264. I don’t have time for maintaining the RMMC for now. RMMC only takes mp4 and mov file. So, You may try RMMC after changing your video file extension name from mkv to mp4. I cannot guarantee it will work, but it is worth to try. Please let me know how it works. Thanks for your answer. I turned as you told me the video in mp4 and everything went well. Only the video from 1.87 gigabytes converted into a video file size of 22 gigabytes. I let the Regulating of RMMC as it was. That quality 10. Should I put it lower to make the file smaller? I am glad it worked. You can change the quality option bigger number. It means it turns out lower quality. In according to ffmpeg manual, the quality “20” is the level human eye cannot recognize any difference from the original. So, you can start from quality level ’20’. If you use ‘lower’ speed option, that will help to produce smaller size, too (probably not much though). What about MKV files? I cannot input them into your wonderful software… Any idea?